La Trilogia Ateniese è situata tra due grandi viali paralleli, in centro città e racchiude la Biblioteca Nazionale, l'Università e l'Accademia. Quando nel 1834 Atene divenne capitale della Grecia, alla rinascita della città parteciparono architetti di fama internazionale. Furono così costruiti nuovi palazzi istituzionali, tra cui questo splendido trio armonico di edifici nello stile in auge in quell'epoca, lo stile neoclassico. Uno stile che collega idealmente l'antica alla nuova Grecia, infatti questo monumentale complesso architettonico ottocentesco, progettato dai due fratelli danesi Christian e Theophilus Hansen, richiama fortemente i monumenti antichi dell'arte greca classica, perchè il loro intento era proprio quello di costruire degli edifici rispettosi dei principi del neo-classicismo, ma che fossero in perfetta armonia con l'architettura contemporanea della città. Il risultato è sorprendente, è incredibile rivedere in edifici più recenti quegli stessi particolari architettonici che è possibile ammirare tra i monumenti classici dell'Acropoli, quasi a creare una continuità con il passato artistico della città, e a testimoniare che l'arte, quella vera, non conosce mode nè tendenze, ma si declina in mille varianti, perpetuandosi, fino a rappresentare una tappa fondamentale nella storia e nel progresso dell'umanità. Il mio outfit per per una passeggiata nel viale della "sapienza" è un look in double denim, la mia divisa casual per eccellenza, perchè non c'è nulla di più comodo, ma allo stesso tempo cool, di due capi in jeans abbinati tra loro. (Clicca qui e qui per saperne di più su tutto il denim più trendy per PE 2017). (Clicca qui per vedere tutti i miei post da Atene). The Athenian Trilogy: the perfection of form. 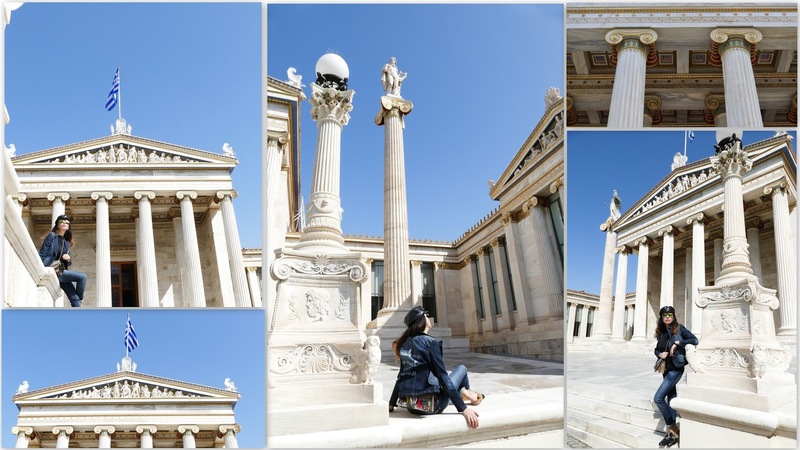 The three indisputable jewels of Athenian Neoclassical architecture: the University of Athens, the Academy, and the National Library. World-famous, the trio of elegant buildings on Panepistimiou Street, stand above the scramble of one of the city center’s busiest thoroughfares. Designed in the mid-19th century, when Athens became the capital of Greece, by the Danish Hansen brothers and completed years later with the help of benefactors and donors, the monumental architectural complex strongly recalls the ancient monuments of classical Greek, because the intent of the two architects was just to build the buildings respectful of the principles of Neoclassicism but, at same time, in perfect harmony with the contemporary architecture of the city. The result is amazing, it's incredible to see in newer buildings those same architectural details that can be admired from the classic monuments of the Acropolis, as if to create a continuity with the artistic past of the city, and to testify that art, the real one, doesn't know fashion trends, but comes in many variations, perpetuating itself, to be a milestone in the history and progress of mankind. My outfit for a walk in the avenue of "wisdom" is a double denim look, my casual uniform par excellence, because there is nothing more comfortable, but cool at the same time, to match two denim pieces. (Click here to read more about the double denim trend). 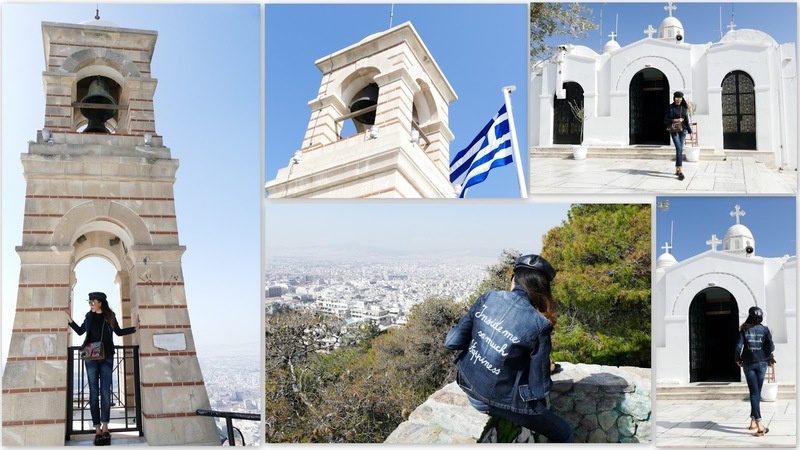 (Click here to see all my posts from Athens). Looking amazing in denim on denim! Your jacket is too cool Paola! Che bella che sei! Queste foto hanno qualcosa di poetico! Amo il denim on denim il tuo è un look veramente fantastico!!!! Really great look! I love your Gucci accessories. Wow, what an incredible place, great styling too! I like this double denim look and the location of your pictures is gorgeous! Meraviglioso il tuo Giubbino !!!!!! Amazing architecture. So classical and elegant. Amazing pictures babe!! Your look is amazing. Beautiful pictures and I love the jacket! nice outfit, and love your bag! your locations are always breathtaking! Dear Paola, so in love with your perfect jacket and how have combined them! Very nice and comfy outfit dear!!! This color really suits you:-) You look so classy! splendida Paola!! che bella la borsa!! Foto fantastiche come al solito! Meraviglioso questo look! Un bacione. This is such a stylish look...I'm loving the jacket! You're right, Paola! Double denim is so chic and cool. And you accessorized it beautifully with your Gucci bag and slippers. I love the look! Un look impresionante y unas fotos perfectas! You look really stylish! Love it! Che foto strepitose Paola, questo total denim poi è pazzesco, look strepitoso! Great post and gorgeous photos! Amazing photos and what a cool outfit! meraviglioso e magico questo luogo! Stunning shots, lady- and I love your slides! che meraviglia!! Mi piace tantissimo anche il tuo look! Splendido il tuo double denim look! Bellissime foto. Bacioni e buona Pasqua Paola! The University of Athens is so pretty ! How are you able to take photos without any people around? So awesome! That denim blazer looks amazing on you! Gorgeous architecture! Have a wonderful Easter weekend dear! I always love that hat on you! The architecture is breathtaking! Un posto stupendo, e tu bellissima! Such a beautiful review!!!! Thanks!